Reserved parking slot for one car. Open style kitchen with all white goods available and extractor hood. As shown in one of the pictures !! ● Linen not provided but can be hired: - Linen 1 pers. (1 fitted sheet, 1 single bed sheet, 1 pillowcase) 10€ - Linen 2 pers. (1 fitted sheet, 1 double bed sheet, 2 pillowcases) 11€ - Towels (1 bath towel + 1 towel) 6€ - Duvet 1 pers. (1 cover, 1 fitted sheet, 1 pillowcase) 12€ - Duvet 2 pers. (1 cover, 1 fitted sheet, 2 pillowcases) 13€ - Bath mat: 4€ ● Inventory during office hours if not the agency will assess alone the amount to be deducted from the security in case of necessity. ● If cleanliness is not PERFECT for next tenants, cleaning fees of 95€ will be deducted from the deposit. ● Stay taxes collected on arrival (0,61€ per person, per day). ● Linge de maison non fourni peut être loué (tarifs ci-dessus) ●État des lieux durant les horaires de bureau sinon l'agence fixera seule, si nécessaire, le montant à déduire de la caution. ● Si propreté non conforme, 95€ de ménage seront déduits. ● Taxes de séjour collectées à l'arrivée (0,61€ par personne et par nuitée). We had a lovely time at your apartment and thank you Veronique for all your help with my enquiries for our holiday place. Our young daughters loved playing in your sweet garden and we enjoyed the wonderful lake views over our breakfasts! The apartment was well equipped for us all and situated very centrally for exploring the local area and visiting other beautiful Alpine places, for the amenities as well as for meeting up with our family close by which was really good! We had a lovely holiday staying at your place! Thank you again! Absolutely lovely peaceful apartment in Publier, only 5 minutes by car to centre of beautiful Evian le Bain. 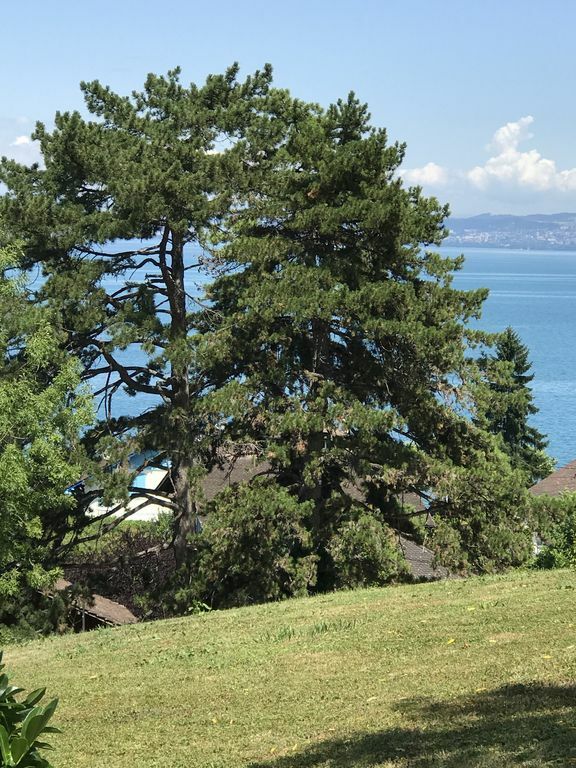 The apartment was spacious, well equipped and extremely comfortable, with stunning views of Lake Geneva from kitchen/living area, patio and garden. We loved our time there. Thank you Veronique. I would recommend highly. Nous venons de séjourner 2 semaines dans cette charmante maison, parfaitement équipée, dans un lieu magique, l'habitation, le jardin, la vue.... whaouuuu !!! tout était parfait !!! Nous avons découvert avec cette région magnifique, et nous sommes pressés d'y revenir. Our house is 3 minutes walking distance from the lake shore and the Restaurant La Table du Grand Lac located just in front of the lake. The house is on a small hill so from the patio you have a grand view of lake Geneva or Leman in French. You can see Lausanne right across in Switzerland on a clear day. Evian city centre is 3 kms and the train station is a 5 minutes drive from the property. Dotted along the lake you have countlless little medivial villages to explore . There are sandy beaches in some and theme parks in others. Plenty of options are available for exploring and visiting something new every day.